Weight - A well balanced little dog not to exceed 6 pounds. Proportion - The body is off-square; hence, slightly longer when measured from point of shoulder to point of buttocks than height at the withers. Somewhat shorter bodies are preferred in males. Disqualification - Any dog over 6 pounds in weight. A well rounded "apple dome" skull, with or without molera. Expression - Saucy. Eyes - Full, round, but not protruding, balanced, set well apart-luminous dark or luminous ruby. Light eyes in blond or white-colored dogs permissible. Blue eyes or a difference in the color of the iris in the two eyes, or two different colors within one iris should be considered a serious fault. Ears - Large, erect type ears, held more upright when alert, but flaring to the sides at a 45 degree angle when in repose, giving breadth between the ears. Stop - Well defined. When viewed in profile, it forms a near 90 degree angle where muzzle joins skull. Muzzle - Moderately short, slightly pointed. Cheeks and jaws lean. Nose - Self-colored in blond types, or black. In moles, blues, and chocolates, they are self-colored. In blond types, pink noses permissible. Bite - Level or scissors. Overshot or undershot, or any distortion of the bite or jaw, should be penalized as a serious fault. A missing tooth or two is permissible. Disqualifications - Broken down or cropped ears. Neck - Slightly arched, gracefully sloping into lean shoulders. ToplineLevel. Body - Ribs rounded and well sprung (but not too much "barrel-shaped"). Tail - Moderately long, carried sickle either up or out, or in a loop over the back with tip just touching the back. (Never tucked between legs.) Disqualifications - Docked tail, bobtail. Shoulders - Lean, sloping into a slightly broadening support above straight forelegs that set well under, giving free movement at the elbows. Shoulders should be well up, giving balance and soundness, sloping into a level back (never down or low). This gives a well developed chest and strength of forequarters. Feet - A small, dainty foot with toes well split up but not spread, pads cushioned. (Neither the hare nor the cat foot.) Dewclaws may be removed. Pasterns - Strong. Muscular, with hocks well apart, neither out nor in, well let down, firm and sturdy. Angulation - Should equal that of forequarters. The feet are as in front. Dewclaws may be removed. In the Smooth Coats, the coat should be of soft texture, close and glossy. (Heavier coats with undercoats permissible.) Coat placed well over body with ruff on neck preferred, and more scanty on head and ears. Hair on tail preferred furry. In Long Coats, the coat should be of a soft texture, either flat or slightly wavy, with undercoat preferred. Ears - Fringed. Tail - Full and long (as a plume). Feathering on feet and legs, pants on hind legs and large ruff on the neck desired and preferred. (The Chihuahua should be groomed only to create a neat appearance.) Disqualification - In Long Coats, too thin coat that resembles bareness. Alert, projecting the 'terrier-like' attitudes of self importance, confidence, selfreliance. Disqualifications: Any dog over 6 pounds in weight. Broken down or cropped ears. Docked tail, bobtail. In Long Coats, too thin coat that resembles bareness. Click Here to Learn about breeder background checks on Chihuahua breeders if you are looking for Chihuahua puppies for sale. Click Here to learn how ResearchBreeder.com can help you find healthy Chihuahua puppies for sale. Click Here to order a Breeder or Kennel Background Check on Chihuahua Breeders that may have Chihuahua puppies for sale. 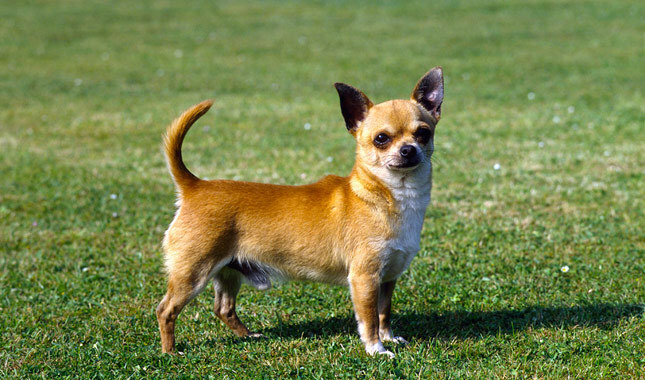 Click here to find the national breed club for Chihuahua puppies for sale. Click Here to purchase a list of approved ResearchBreeder.com Chihuahua Breeders who have Chihuahua puppies for sale.